Aaaahhhh! Okay, Okay! I start to feel guilty because it's been a month I postponed publishing this post. At first I was excited, but then I lost my mood and think that it's really unnecessary to publish such post. 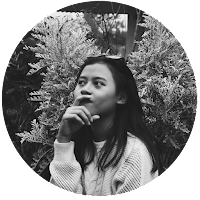 And again, because I scrolled down my page (which I told you I do it every time I don't really have anything to do), then I felt guilty because I always made a post every time my blog got updated, (which you could see on #Blog Stuff). So, here they are I'm telling you! 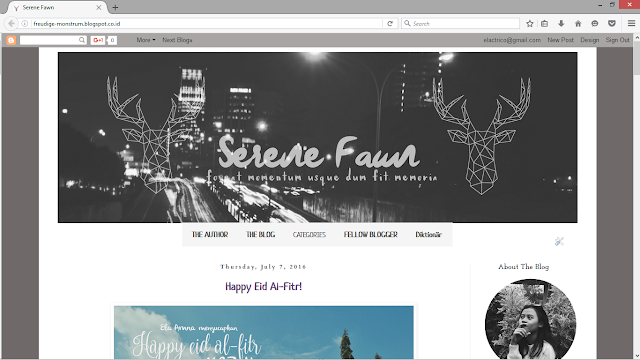 Some of you may not yet notice that I'm changing my blog's concept and layout as well. Honestly, I'm not really fond of telling how or why I changed it, but any way, I will tell you then. So, first of all, why oh why in the world is "Serene Fawn"? I don't know, may be because I like the way it sound, and also because I want this page of mine sounded a bit more mature and may be, calm, I guess. You know, the previous "Happy Mons" is still there honestly, I'm keeping it as the part of this Serene Fawn. As the always happy monster is now improving to be a more calming and serene little feminine deer, which you could also guess. After a thoughtful and time-consuming research, I finally came with an idea of Serene Fawn. Well, there's really so much to consider about, and all the ideas behind it. But I wont tell you that, because this post just might turn out to be too long to read, lol. and, why is that Serene? (adj) means calm, peaceful, and untroubled; tranquil. I desire this journal could be my own serenity that brings peace to whoever come to this. and why is that Fawn? why can't you just come out with another animal? well, the reason is because deer is my spirit animal. gentleness, innocence, and seller of adventure. Deer is just another deer, deer is bambi. as the spirit of both happiness and serenity. and Tahdah! okay that's embarrassing. and too much hoping already, lol. oh, and also I would have this dearly deer celebrate its birthday on June 1st, 2016. And the reason behind that is just because I officially changed the concept on that day, haha. Not so much changing on the template, but more of the concept, indeed. And I hope you could enjoy as much as I do, and again, let's hope that this tempelate and concept would stay long hanging on my page, as I am an easily bored person. My first template, well the pinkish one did last for 2 years, and then I changed to a fixed template which I didn't know how to edit, and it sickened me tbh, haha. And it last for a year, before I changed to the purplish one. And the purplish one also only last a year, (Nov 2015 - June 2016) haha. But I think, that is very okay, since we, human, also try to improve to be better every time, right? To that, it's a very common okay to me, haha. Until then, see you when I see you!